Bonnie Flanagan contacted Deb Carriere (Dannec) about an error she found on her red top Tropical Birds. 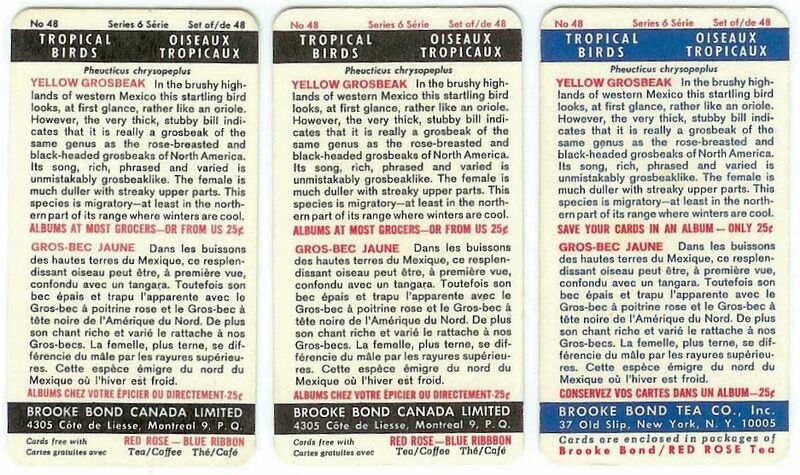 Thanks to Bonnie's enquiry, we have a new error on all of the Tropical Birds Red Topline cards. Yup, it's been there all along on every one of them... at least all of the cards I have. The discovery was made in early May of 2006. So what is it? What did Ms. Flanagan find? She found that on the Canadian red topline version of the Tropical Birds, the printer got a bit carried away with the 'b's in the word Ribbon. You can see the result in a comparison of the black topline card (pictured above) to the red topline card (pictured below). The top image shows the black topline with the correct number of 'b's in Ribbon. The bottom image shows the red topline with the excessive use of 'b's. What about a comparison? Here are the 3 known series variations, Canadian Black Topline; Canadian Red Topline; and US. The two Canadian cards are very similar but the US cousin doesn't even mention 'Blue Ribbon' at all. I guess it's a Canadian thing. It's pretty clear which is the error, assuming you have the ability to spell. The printer missed this one. To my knowledge, it was probably never caught... until now. Good eye Bonnie! Again, thanks to Bonnie Flanagan for noticing this interesting error and also to my friend Deb Carriere for always putting the hobby first.